The holiday season is approaching, and you are ready! You prepared everything in advance... you started buying gifts in October (or earlier, like me!) and you have a list of guests that you checked twice. But the end of December rolls around and, suddenly, it is Christmas Eve and you realize you forgot someone! Or your cousin who originally said they could not make it, texts you to tell you they will be there. Oy vey! 1. Open your Pinchbook photo book so the spine expands. 2. Insert your photos into the spine. 3. Close the covers...and your're done! It is really that simple! Gosh I love these things! Ready to buy? Click here to choose your photobook color and size. Ok, so you know how to get your photos printed...choose a 1-hour photo store, or print them from your home computer with some photo paper. My preference it to have them printed professionally because the quality is so much higher than my home printer. But if they are closed for the holidays, you may just need to print them at home. So let's not waste any time -- I make the photo printing the first thing I do by uploading my photos from Facebook onto my photo store of choice, and send them the order for 1 hour pickup. While I wait, I continue cleaning and decorating the house for our guests, so there is no wasted time. 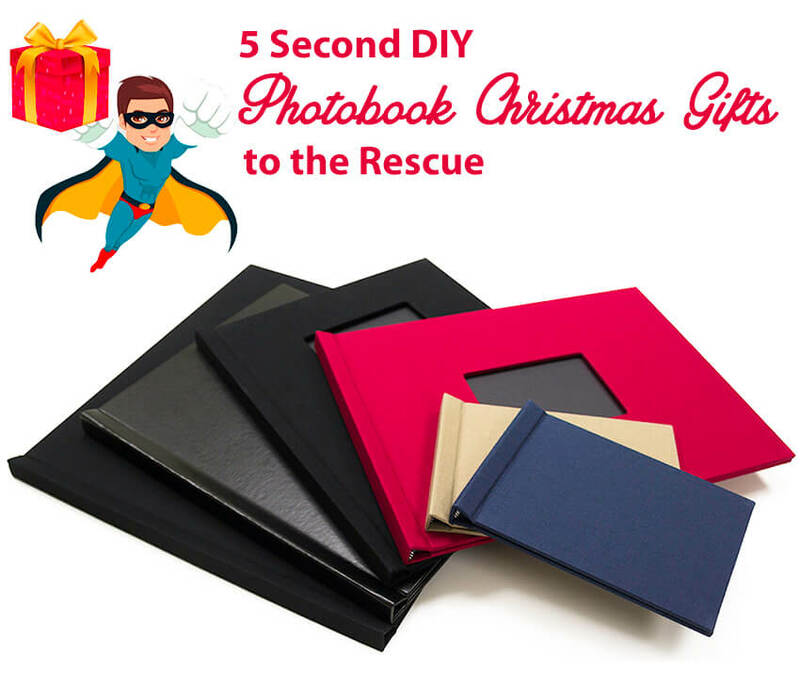 Then I pickup my photos, use my little trimmer, if needed, and stick them into Pinchbook hard covers using the 3 steps above and, vualá, I have a gorgeous photobook gift! The best thing about them? They don't look like they were a last-minute gift! For one thing, a photo gift in general always looks like it took time, thought, and heart. Plus, the albums are made of a really strong hard cover that is wrapped in a pretty linen textured cloth (faux leather is also available). They actually look expensive! But thankfully for my wallet that is already above budget, they are a very cheap photo gift! They start at only about $14 for a box, and the box quantity has either 5 or 10 books, depending on the size. Normally I would only want to buy 1 for that 1 last-minute gift, but they are so simple and pretty (and inexpensive), that I don't mind having a few extras for future gifts (or to hoard for myself, lol). Here is a video of the photobooks that I used for Christmas gifts for our family 2017 Christmas gathering. And that's it! So easy, right?! You are left with a gorgeous personalized photo gift. And no one will ever know how fast and easy this gift was! Muahaha! Coupon Details: 5% off Pinchbooks. Coupon code cannot be combined with other coupons, discounts, or offers. Limited time offer. Subject to change without notice. Code must be used during the ordering process; cannot be applied to any order after it has been placed, shipped, or delivered. Call (866)537-2244 (866)537-2244 with questions.